Dedication and planning were the keys to this entry’s success. The judges were impressed with the thinking behind the project, and the way the team allocated resources. They also gave a big thumbs-up to the original video content. 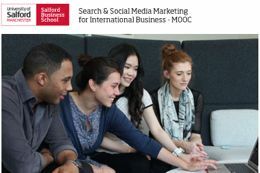 "The aim of the group project was to develop a Massive Open Online Course (MOOC) which introduces businesses and students to the use of Social Media for international business development.Objectives:1) Research and develop exact topic names and industry needs for MOOC learning material.2) Research and select technical platforms for MOOC delivery.3) Research and develop 12 learning modules which are based on pedagogic foundations of MOOC learning.4) Using Search and Social Media Marketing techniques engage at least one thousand participants to take part in this MOOC by the end of this pilot." An entry must be a digital artefact - such as a website, mobile application or animation. Submissions should demonstrate creativity or technical ingenuity in the design or creation of the artefact. Entries are welcomed from any further or higher educational institution up to a maximum of one for any one course. Each entry can be the work of a single student chosen by the institution from individual entries by different students, or it can be a collaborative work involving a number of students. The work should have been completed by students while studying at the institution as part of their course work at some time between April 2013 and March 2014. James is one of those students we all love. Besides his coursework, James is busy creating a portfolio of his 'side projects', all of which show his passion for web development. Unlike many of our students who's focus is on front-end development, James likes to stretch his programming talents to the max. The project submitted is a tool James has developed and coded for himself to help him to try and test a variety of colour schemes for his latest designs. The Junior Vets game allows the CBBCers to dive online and play a fun authentic game that reflects and extends the TV series. Kids develop their diagnostic skills to help a range of animals from general pets, through farm, to more exotic Zoo creatures. Once diagnosed, perhaps with help from our online Vet and show presenter, players use a range of treatments to help their selected animal. Treatments range from simple parasite extraction, or object removal (mid those sharp edges) to more complex laser surgery and stitching. With over 300 cases to treat the game could take months to complete. This was one of the hardest categories to judge this year, but after much deliberation the judges went for Michael Stephens' work on how context awareness can increase the security of systems without compromising their usability. They felt the video explained the key concepts simply and succinctly, setting them in a real-world context to make them easy to understand. A short animation and video compilation that illustrates the content of a final year project from the department of Computing & Mathematics at Manchester Metropolitan University. The project investigated context awareness and how it could be used in the authentication process to increase security without compromising usability. The animations purpose is to communicate the concepts and processes that were used in the solution. These were ideas that would have otherwise been difficult to explain concisely using more traditional types of media. Entries are welcomed from any further or higher educational institution up to a maximum of one for any one course. Each entry can be the work of a single student chosen by the institution from individual entries by different students, or it can be a collaborative work involving a number of students. The work should have been completed by students while studying at the institution as part of their course work at some time between April 2011 and March 2012. The brief for this project was to create a piece of communication to celebrate the 20th anniversary of Sonic The Hedgehog. An entry must be a digital artefact - such as a website, mobile application or animation. Submissions should demonstrate creativity or technical ingenuity in the design or creation of the artefact. Entries are welcomed from any further or higher educational institution up to a maximum of one for any one course. Each entry can be the work of a single student chosen by the institution from individual entries by different students, or it can be a collaborative work involving a number of students. In choosing the winner in this category, the judges agreed that there is no better advertisment for an educational establishment than that its students produce great work, and that's exactly what the 2010 Little Chip winner did as a key part of one of the judges' overall favourite entries this year. The judges set a minimum standard for shortlisting any Big Chip category and felt only one of the student entries met this standard. Entries must be a digital artefact - such as a website, mobile application or animation - that could be used to promote some aspect of the entrant educational institution. Submissions should demonstrate creativity in the design of the artefact or in the way it is used to promote the institution, or both. One entry is allowed from each educational institution. This can be the work of a single student chosen from individual entries by different students, or it can be a collaborative work involving a number of students. The Little Chip Student Award was a new introduction in 2010, open to higher and further education institutions from across the North of England. 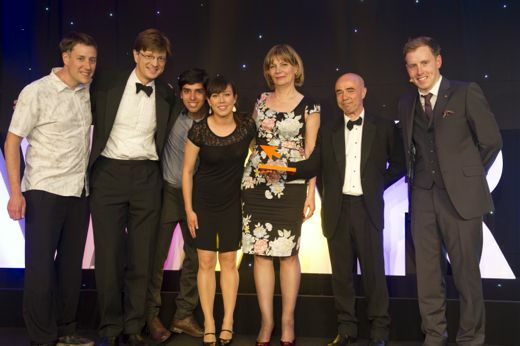 The last student award in Big Chip was the MANCAT Promising Student Award in 2008, open to students of MANCAT. The brief was simple: 'Make an On-line portfolio of your work'.